The housing market may be geared towards building fortunes, not homes. Condominiums under construction in Toronto, July 10, 2011. Data released on Friday showed urban construction starts for multiple-unit buildings, typically condos, surged 16.9 percent in November to 175,016 units, a record high even after a decades-long boom. VANCOUVER/OTTAWA (Reuters) — Canada's two largest housing markets, Toronto and Vancouver, are being held aloft by booming condo markets as investors and developers stick to an asset they love, fueling charges that the market is geared toward building fortunes rather than homes. Data released on Friday showed urban construction starts for multiple-unit buildings, typically condos, surged 16.9 percent in November to 175,016 units, a record high even after a decades-long boom. 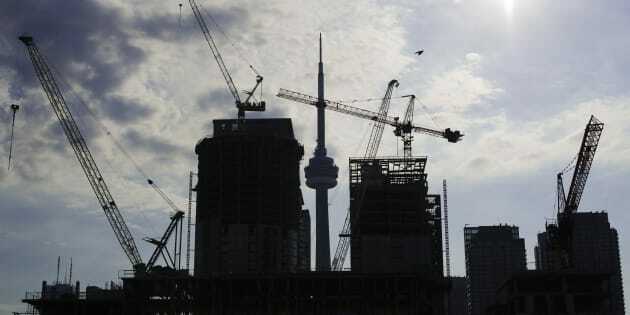 Beneath a skyline of cranes, the majority of condos being built are one-bedroom or studio apartments aimed mostly at buyers betting on price appreciation, along with some first-time buyers seeking a foothold, rather than families or so-called end users seeking a house that will grow with them. "Investors are looking for product that they can put the least amount of money down for and realize a profit when they resell it down the road," said Michael Ferreira, principal at consultancy Urban Analytics. According to market research firm Urbanation, about 60 percent of units under development in Toronto are studios or one-bedrooms, a complete reversal of the trend before 1990, when nearly 70 percent of units had two or three bedrooms. The condo boom is not meeting the goals of urban planners and Canadian families looking for an affordable alternative to the sky-high prices of detached homes. Instead, it benefits foreign and domestic investors looking for profit and income. New condominium towers are seen under various stages of construction in the Yaletown district of downtown Vancouver, B.C., Nov. 19, 2016. Condo prices rose 21.6 percent in November from a year earlier in the Toronto region, according to the Toronto Real Estate Board's Home Price Index, far outstripping the 4 percent rise in detached home prices. In Vancouver, condo prices are up 23.9 percent in the same period, compared to a 6.1 percent gain in detached home prices. "The massive (price) increases just attract more and more of that speculative investor creeping into the market," said Ferreira. Government efforts to force developers to build "family-friendly" condos has resulted only in tiny three-bedroom condos suitable for students — in other words, more investors. Vancouver's General Manager of Planning Gil Kelley warned last week of "a very extreme level of speculative investment," with most supply targeted at high-end investors. While some industry watchers play down the impact of flipping on the market, both Ontario and British Columbia are working with the Canada Revenue Agency to track investors who evade paying higher speculator taxes. But fears about the kind of condo glut seen in Miami are overblown, said Robert Hogue, economist at Royal Bank of Canada, because developers in the country do not break ground — or get financing — until most of their units are sold, typically only with a down payment. "There is effectively no building 'on spec' in Canada, and this is a sharp contrast with the situation we saw in the United States," said Hogue.